You're travelling and it always seems to be something to do for the kids, endlessly you visit tourist attractions, play parks and chocolate shops for the children. 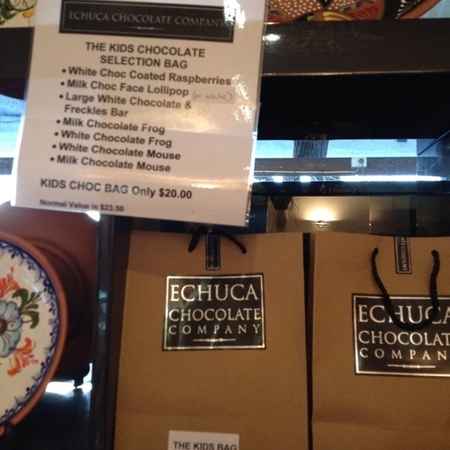 Finally, you come to the Echuca Chocolate Company shop and as you enter you are delighted to discover that whilst the children will be most happy here, this is the chocolate shop with the difference -this one is for the adults. 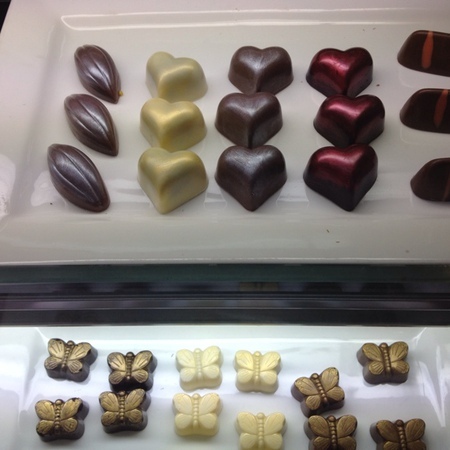 As you walk past the glass cabinets filled with individual chocolate treats that you can take home, you will be immediately offered a selection of White Milk and Dark Belgian Chocolate to try at no charge. Your taste buds now tickled to something sweet, you may cast your attention to the chocolate liquids (liquors and fortified wines). Even the name sounds enticing - White Chocolate Port, Dark Chocolate Wine, Creamy Chocolate Liquor. And if you like sweet wines, you're sure to be delighted by these ones. You'll be generously offered a sample of each and every one of the wines you wish to try. However it doesn't end here, you can purchase them in a giftpack and for every liquor/wine purchased you get to choose a free chocolate pack to go with it. And well, what can you do at this point - you are on holidays after all and it would certainly be nice to sit down to the sherry type port style fortified wine in the evenings back at camp or your B&B. So if you're anything like me, you will be unable to decide and end up purchasing all of them - but hey you do get a free chocolate pack with each one. 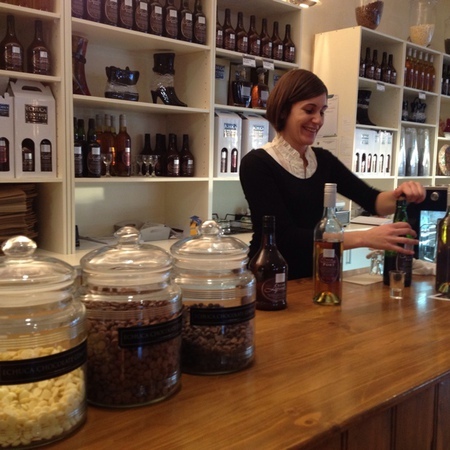 If alcoholic beverages is not your thing, the Echuca Chocolate Company shop has many sweet treat to delight you. 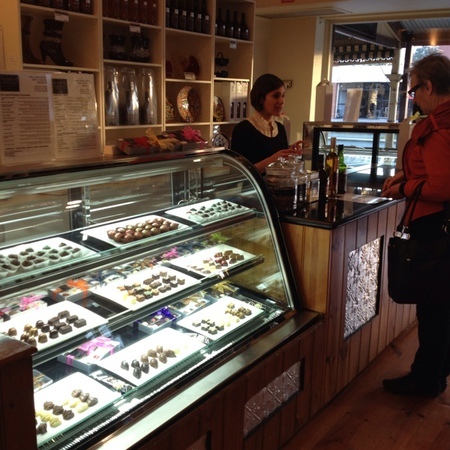 Whether you wish to purchase individual chocolates to eat here or take away or would prefer larger size giftpacks or bars they have it all. 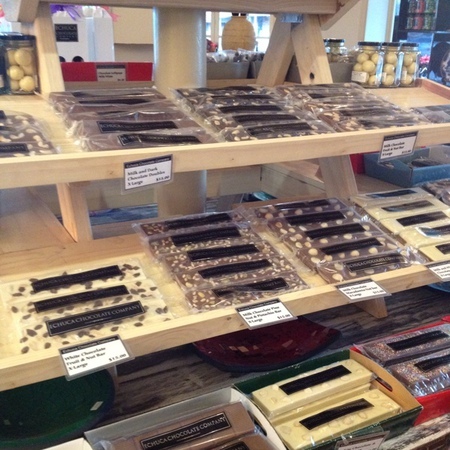 All are freshly made on the premises and you're welcome to look, watch and sample whilst you decide. I bet you can't leave without purchasing something. Why? 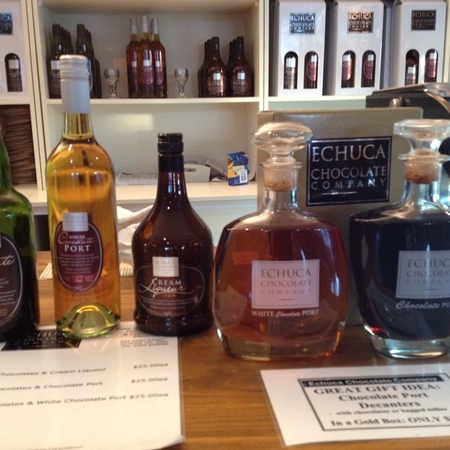 Delicious chocolates and now chocolate wines - yum!